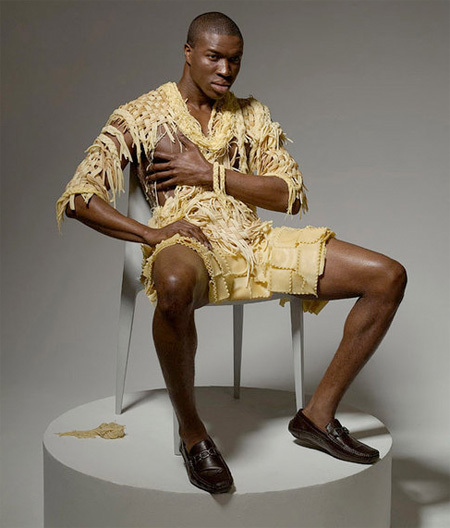 Cool photo series by Ted Sabarese features clothing made out of real food. 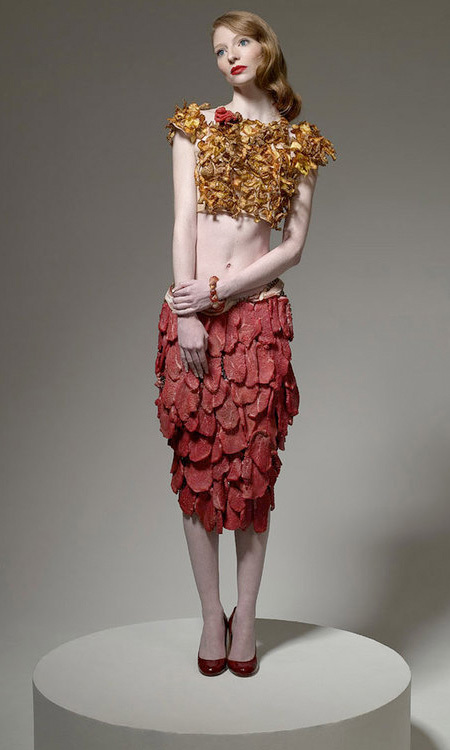 Hunger Pains project was created in January of 2009 (before Lady Gaga’s meat dress). Each outfit took hours to cook and assemble. Love the last one! And meat skirt FTW. 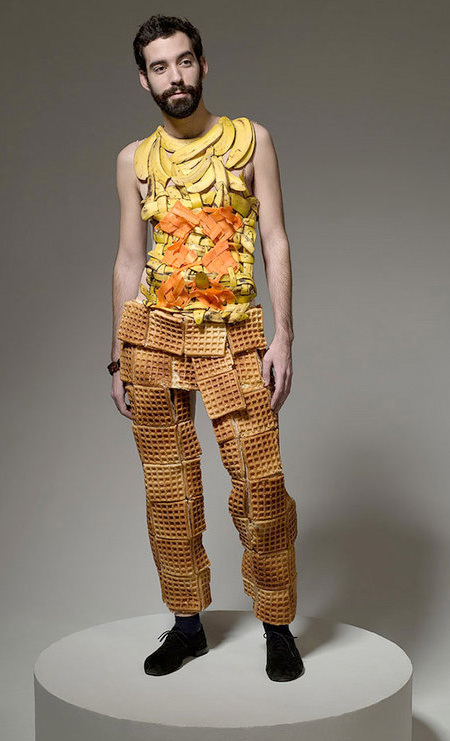 I WISH I HAD A PAIR OF WAFFLE PANTS! The last one is great but everything else is blah. This is outrageous! Okay, I know it’s art.. but #1 – don’t you dare sit on my couch/car seat… #2 – you stink… #3 – this doesn’t even look good… #4 – SOME PEOPLE DON’T HAVE FOOD TO EAT IN THIS WORLD!! WTF?! so Lady Gaga shops here ? 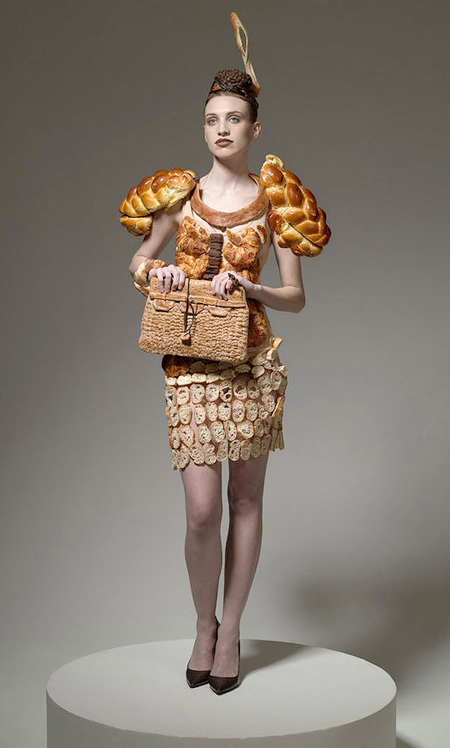 I like the lady in bread. For some reason, I have a really strong urge to punch the hipster wearing waffle pants. b) if you did leave the pedastal, just think of all the flies and dogs that would take an interest in you!!! Discusting.And not very creative.Except the vegetable-one ,that’s nice.But not a single thought behind it.With a little effort and intelligence,so much could be said…. The comments of disapproval on Toxel make me laugh. Come on guys. These were created as a one off, for fun, I doubt hundreds were made with tonnes of food being wasted. Get a bloody grip, people. Heck, maybe not just for fun, but for a good reason; not a new way to waste food. although I agree with the fact that there’s famine in the world, there is something more important: THE WHOLE WORLD WOULD BE FED THREE TİMES WITH THE ONE YEAR WASTE OF EU AND AMERICA! so compared with your wastefulness, this is nothing, and you arguing about this project seems really funny. And its very creative, i like the way the colours of food is used. Wow some of you people take things waaay to serious! It’s for the image and that’s it. Of course it would fall apart, stink, get flies on it. It’s not meant to go anywhere but the pedestal for the image. You can’t argue that they were for the most part well executed. 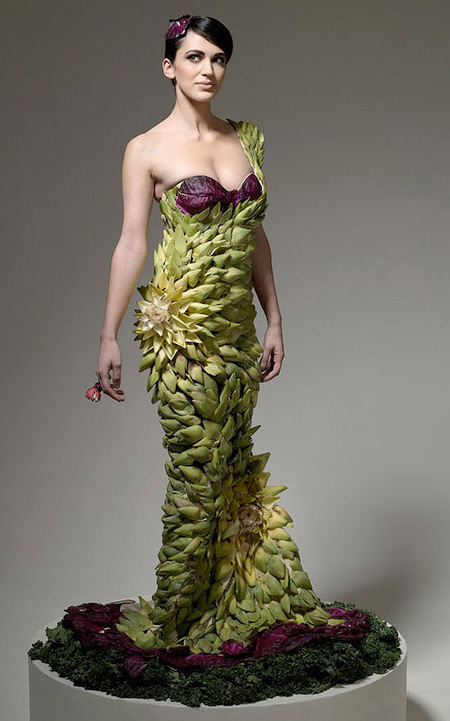 They look like high fashion couture made of food! A waste? No way! It’s not even that much food. Go to a grocery store and see the piles and piles they throw away daily! My only critique would be the lighting and background. Boring IMO. This is what’s wrong with the world. This. Okay. This is not WHY there are starving people. This artist is using food just like another might use paint. Any artist who goes and buys paint could just as well go send food to Ethiopia. I hope that’s what all of you trashing this collection are doing. Appreciate the art.